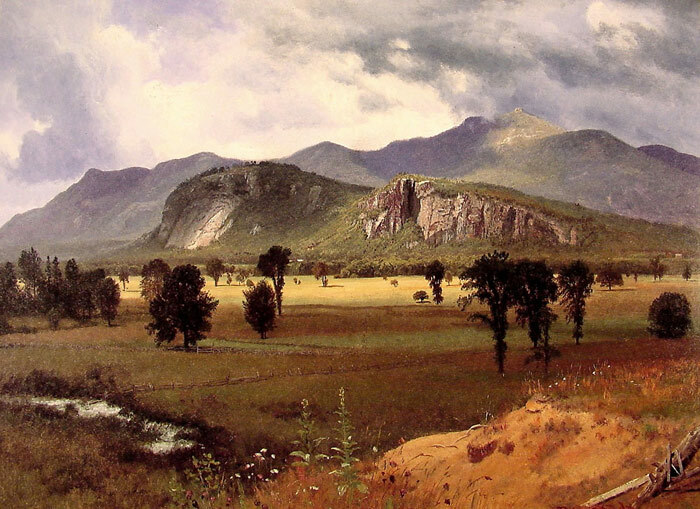 Bierstadt's Moat Mountain, Intervale, New Hampshire, c. 1862 was painted from sketches Bierstadt made in the White Mountains during the summer of 1860, and accurately depicts the topography of the area of the Intervale in North Conway, New Hampshire which includes the White Horse and Cathedral Ledges, and Moat Mountain. The stillness effected in the foreground by the fenced and sunny fields of the Intervale contrasts with the threatening skies above the distant mountains. This tension is typical in the art of the Romantic era, which explores the relationship between man and the natural wilderness. SPECIAL NOTE : The painter will make the reproduction as close to the original oil painting as possible. If you want your painting to alter from this likeness, please email us and " Moat Mountain Intervale, New Hampshire, 1862 " will be reproduced according to your special requirements.